Showing 51 to 66 of 66 job(s). M&A Actuary. Top consulting firm seeks pre-ASA to new/near-FSA to join M&A group. Ideal candidate will have a strong quantitative background; including solid experience with Excel, VBA, C++, Matlab and/or other programming languages. Experience in Insurance product modeling and/or Risk management preferred. Midwest Region. Sr. Manager, Consulting. Seeking an FSA to take the lead in developing and executing on a business plan for the Life sector. This is a challenging position that will also include scoping and defining appropriate analytical tests to achieve client objectives and being responsible for interpreting client generated analytical results and preparing client reports. The ideal candidate will have extensive US GAAP experience, as well as previous consulting and management experience. Reinsurance experience would be helpful. Offshore location. Life Practice Lead. Consulting shop looking to expand their Life Business. Will lead small/growing team and develop new business. Little travel. Great work-life balance. FSA preferred with more than 10 years of actuarial experience. Ideal candidate will have prior experience working at both a Life Insurance Company and Consulting firm. Southeast Region. FRM Actuary. Top firm is looking to add a few actuaries to their growing team. Work will focus on Variable Annuity Hedging, Risk Management, M&A and additional consulting assignments. Ideal candidate will have strong communication skills, good SOA exam progress toward FSA, and 2-5 years of actuarial work experience. Midwest Region. Annuity/Life Pricing and Modeling. Our client is seeking an FSA with 5 to 10 years of actuarial work experience. The ideal candidates will have Annuity/Life pricing experience or modeling experience to build PBR into their pricing models. Prophet and PBR experience would be very helpful but it’s not required. The candidate should have solid technical skills, as well as strong communication skills. Eastern Region. 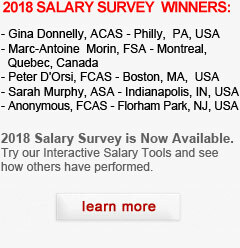 Salary: Competitive. Variable Annuity Hedging. Looking to learn something different? Top firm is looking to hire a junior actuary with an entrepreneurial personality. Must be energetic, have excellent communication skills, solid programming knowledge and be fast-tracking through the SOA exams. Ideally 2-8 years of actuarial experience. Midwest Region. Salary: $85,000 – $130,000 plus bonus.